With the West Coast ports labor dispute involving 13,600 unionized dockworkers inflicting pain on 318 million Americans by causing billions of dollars a day in losses to the U.S. economy settling yesterday, now 30,000 unionized refinery workers across America intend to play the same leverage game by cutting off two-thirds of all U.S. diesel and gasoline supplies. Just after US Labor Secretary Tom Perez took to the television circuit to tout how the Obama Administration believes the US economy can “recover quickly” from the nine months-long port turmoil, the United Steel Workers (USW) launched the first nationwide oil refinery strike in 35 years, which will drastically reduce fuel supplies to ships, trucks and railroads trying to clear the docks and relieve bottled-up American supply chains. The USW represents workers at 65 refineries that produce about 64 percent of US petroleum-based fuel production. 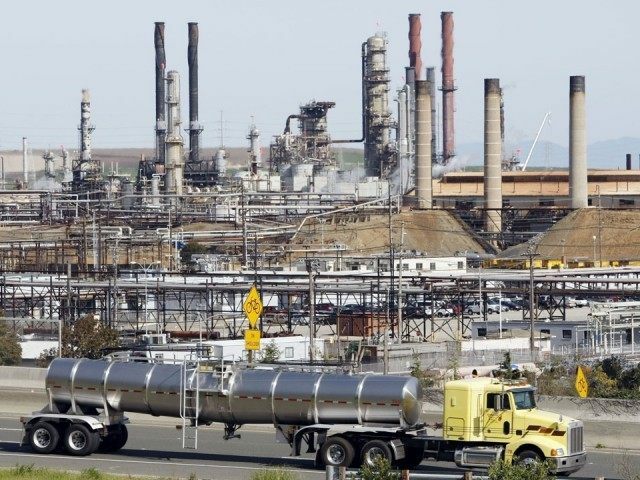 A union spokesman said the USW expanded a strike that started at a couple of refineries in Texas and California, because the industry refused to “meaningfully address” safety issues through good-faith bargaining. But the real issue is who pays the Obamacare “Cadillac Tax” on “gold-plated” health plans. Breitbart News, in “Cal Fruits and Crops Rotting at West Coast Ports In Union Fight,” chronicled how the labor slowdown at the 29 West Coast ports between employers represented by the Pacific Maritime Association and members of the International Longshore and Warehouse Union, whose members command average wages and benefits of about $1,200 a day, was causing $2 billion a day in economic damage to the U.S. economy and letting about one third of West Coast agricultural exports rot. The labor dispute was settled with the ILWU signing a five year contract that included maintenance of nearly no-cost health coverage, an $11,000 increase in maximum pension benefit to $91,000 a year, and a $1-per-hour wage increase over each of the five years. Perhaps the most egregious element of the new contract is that despite fighting for the rest of America to be forced into Obamacare, ILWU members negotiated that employers will have to pay the approximately $11,000 Obamacare “Cadillac Tax” on the ILWU’s $40,000 a year “gold-plated” health insurance plan. The USW appears to be timing its shut-down to leverage the built up port turmoil that was expected to take up to two months and tons of overtime to clear. The USW struck 15 plants, covering about 6,550 union members, on February 1 when it rejected a new three-year contract negotiated with employers represented by Shell Oil Co.
Worker duties at the highly automated plants are to minimize process interruptions by 1) anticipate machinery malfunctions and develop contingency plans; 2) conduct process control; and 3) ensure smooth refinery operations through efficient use of equipment. “Safety issues” is usually union code for increasing staff levels and eliminating non-union contractors that do daily maintenance work. But the USW refinery workers, like ILWU dock workers, are also part of the 26 million American workers in multi-employer health plans who are subject to the Obamacare “Cadillac Tax” on “gold-plated” health insurance plans. It is difficult to project how long it will take before the strike will start restricting fuel supplies, but prices are already moving up. As companies begin to start hoarding fuel stocks, the 30,000 USW refinery workers will start causing billions of dollars a day in economic damage to the U.S. economy–and perishable crops will again rot.